Use them for home remedies ~~~ some work! Fresh herbs freshly cut from pots growing on window sills, purchased from FarmGates, Grocery Stores or Farmers' Markets and used in food preparation are far superior than the herbs that are purchased dry. Just take a leaf from the plant, rub it gently between your fingers and the experience of the aroma on your fingers is just wonderful. Freshly picked Herbs "right from the plant"
They can't get any fresher! Arugala Spicy, nutty flavor that adds spark to salads and stir-fry dishes. Balm (Lemon) Lemon scented leaves and sprigs used to make teas and cold drinks. Basil Fresh, sweet, subtle flavor. Use in tomato and pasta dishes. Catnip Cats love this plant and it is used to flavour teas. Chervil Add to fish sauces, potato salads, and scrambled eggs. Chives Mild onion flavor. Use as accent for salads, stir-fry, omelets, and egg dishes. Cilantro A must for salsas, curry, stir-fry, Oriental and Mexican dishes. Dill Light dilly flavor. Use in fish sauces and vegetable dips. Serve with fresh potatoes and vegetables. Feverfew A native American herb with single white daisy like flowers. The flowers are said to repel bees and a tea made is said to relieve headaches. Garlic Chives Great garlic flavor to complement garlic toast, saut�ed vegetables, and marinades. Horehound Leaves are used for flavouring juices and teas. Hyssop Similar to mint flavour, use small amounts in salads. 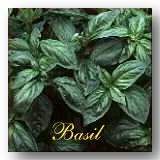 Italian Parsley Flavors soups, stews, pasta sauces, etc. Lavender The dried flowers have been used to perfume linens and in potpouri. Lemon Grass Creates a lemon flavor for stir-fry and soups. Also makes great tea. Lemon Thyme Adds a light lemon flavor to chicken and fish when grilled. Loveage Flavouring for soups, stews and casseroles. The flavour is much like celery and of the yeast extract Maggi. This herb can replace meat and bone stock in soup. Marjoram A delightful addition to poultry stuffing, egg dishes and vegetables. Mint Sweet spearmint flavor. Use for cool summer drinks, sweet peas, and new potatoes. Oregano A must for pasta, spaghetti sauces, pizza, and other favorite Italian dishes. Rosemary Flavors chicken, lamb, marinades, baked meats, and fish. Sage Complements poultry, dressings, sausages, lamb, and veal. Savory Adds an unusual sweet flavor to green vegetables. Sorrel A tart taste to complement cream sauces and fish. Adds fun to salads. Tarragon Light anise flavor. Add to wine, vinegars, chicken, and beef stroganoff. Thyme Complements vegetables, soups, breads, and meats. Watercress Light, snappy flavor. Accents salads, soups and sandwiches. the FarmGate Newsletter mailing list.